Dispersed Storage is an innovative approach for cost-effectively storing large volumes of unstructured data while ensuring security, availability and reliability. Dispersed storage technology uses Information Dispersal Algorithms to seperate data into unrecognizable slices which are distributed via network connections to storage nodes locally of across the world. The collection of dispersed storage appliances creates what is called a Dispersed Storage Netowrk (dsNet). 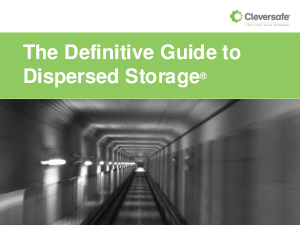 With Dispersed Storage technology, transmission storage of data are inherently private and secure. No complete copy of the data resides in any single storage node, and only a subset of nodes needs to be available in order to fully retrieve the data on the network.